In an increasingly digitized world, adaptation is necessary, if not for getting ahead of the competition, for survival. The business world is becoming more cutthroat than ever, and industries are becoming more aggressive in their approach to earning profit and make businesses grow. They are also not averse to investing money towards the hunt for new technology or service that they can use to achieve this. Local merchants and retailers are especially keen on finding tools that will help them grow their business and their profit. Therefore, they see that their marketing programs and sales strategies are designed to generate leads and sales. The internet certainly figures greatly in almost all business plans, and this should not come as a surprise, really. After all, it is a fact that if you want to get ahead, you have to be “connected”. Combining local commerce with online commerce (also known as e-commerce) will certainly accomplish that. In this article, I will explore 1) what local commerce is, 2) the evolution of local commerce, 3) current and future trends in local commerce, and 4) some successful local commerce businesses. There are several misconceptions and confusions as to what local commerce is. Local commerce involves a buyer ordering a product from a seller, and the seller delivering the product to the buyer from the closest location. This effectively reduces the time and the cost of logistics involved and also establishes a certain level of trust between the two parties. This largely arises from the fact that the buyer is making his purchase from a nearby, or local, merchant or retailer. Local commerce also refers to the use of web and mobile technologies in order to make purchases from local merchants. Consumers will use these technologies in order to look for the products they want or need, interact with the local merchants to order the products, and have the products delivered to them. Confusion is still rampant when these two – local commerce and e-commerce – are mentioned. Some say they are one and the same; others argue that they are two completely different types of commerce. The conventional view on local commerce involved the actions of buying and selling being performed in person, where the buyer and the seller are in one place at the same time. The interaction takes place with the two parties being face to face. E-commerce, on the other hand, was set up on the premise that sellers can offer their wares or goods and buyers can purchase them, even if they are literally worlds apart. Anyone can order and buy anything, regardless of where they are located. Quite possibly the most recognizable name in e-commerce is Amazon, where a student in India may purchase a book in Alaska. The physical location of the goods will not matter; buyers can place their order from the comfort of their own homes. The buyer and the seller do not even have to know how the other looks like in order to complete a transaction. Basically, the main difference between the two is the proximity of the buyer and seller. In other areas, they are somewhat similar. 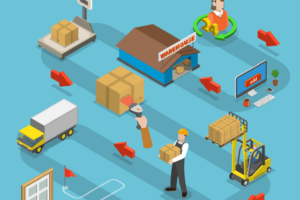 Today, although e-commerce businesses are not brick and mortar stores, they do maintain physical structures to warehouse the goods that they will deliver to buyers. In the same way, local commerce is now largely facilitated by the internet, which is seen as a feature of e-commerce. In the past, local commerce was seen as a strictly offline operation while e-commerce is purely online. Now, that is no longer the case, since e-commerce also has offline operations. Still, what sets the two apart is proximity. In local commerce, the fulfillment of orders is done locally, although payment and ordering take place online. E-commerce, on the other hand, allows order fulfillment to be other than local. The next question would be: which is bigger, local commerce or e-commerce? As much as the world is now recognizing the great number of people making their purchases online, studies show that, as of 2013, in the United States, e-commerce only holds 5% of the retail market. The other 95% is still occupied by brick and mortar stores. In this context, local commerce still falls under the brick and mortar category. Today, local commerce is most commonly characterized by the use of any online or mobile tool, service or technology by local merchants and consumers. But that is not how it has always been. It is quite interesting to see how the local marketplace has evolved throughout the centuries. It certainly has come a long way from the agora, or the open-air, often tented, marketplaces where merchants and craftsmen set up shops to sell their goods and wares. Here, retailers, traders, and middlemen interact and sell their products to all the buyers that purposely head to the agora to check out what are on offer. During ancient times, camels and carts characterized marketplaces. Then came the introduction of the bazaar, which is a permanent enclosed merchandising area where goods are services are sold or exchanged. Retail stores then began being set up, as retailers found more stability in the permanence of space for their goods and services. Today, online stores are now becoming the new trend in local commerce. In order to fully appreciate how local commerce has evolved, let us take a look at some of the things that local commerce has made possible. Paperless transactions are enabled, thanks to paperless technology. Yellow pages are now used mainly to light up the fireplace, and telephone companies are now cutting back on their printed telephone directories. Direct-mail companies are also dropping off one by one as there no longer seems to be much of a demand for their services. Cashless transactions are becoming the norm. In the past, before leaving home, you would have to check if you have enough cash to tide you over for the entire day. Today, all you are probably going to need are a few notes, a card, and your mobile device. In fact, you can definitely get through the day using just your mobile device, paying for local products and services by tapping or waving your smartphone. Increase in revenues and the number of customers. This is a good reason why local commerce is encouraged among small businesses. There is a noticeable growth in sales as well as the number of buying customers. The convenience that local commerce offers is the main reason why more and more people are opting to make their purchases the “mobile way”. The increase in revenues and sales will also be attributed to the fact that businesses are able to open 24 hours a day, 7 days a week. That means that buyers who shop even in the middle of the night will be able to do so, instead of waiting for the brick-and-mortar store to open. Since payments are also made through a cashless system, collecting payments will be relatively easier for businesses. Transactions are processed almost instantly, since payments get through immediately, instead of having to deal with waiting times for payments to clear through the banks. Commerce is constantly evolving, and if history has taught us anything, it is that things will always change. It is up to us to adapt to these changes and make them work. We are currently enjoying the many benefits of local commerce, and it is also mostly assured that this will continue long into the future. Let us take a look at the current trends in local commerce that we are presently enjoying, and the trends that will shape its future. Shopping can be hard work. You would probably have to devote an entire day for shopping for a single set of outfit, considering the amount of walking you will have to do from one store to another. If you are a stickler for details, you’d probably have to map the whole shopping expedition beforehand. Which store should you visit first? What shop will you check out for your shoes? Which shop for a pair of jeans? And since you are going to be walking for hours on end, you’d probably have to decide on which footwear will be most comfortable for walking. But there is now an alternative. While still wearing your pajamas, you can remain curled up in bed, turn on your mobile device, laptop or desktop, and view millions of products, without stepping foot out the door. In the future, expect to see not only product-based marketplaces. Service providers are also making their offers to consumers online, but soon, we might expect large-scale service-based marketplaces. Through these marketplaces, you can get access to a wide variety of services and service providers, from cleaners and plumbers, event planners, and travel planners, to builders and carpenters. Do not be surprised if you will also see lawyers, financial consultants, and insurance agents offering their services in a single online marketplace. In the past, when you want to find out where to get plumbing services, you’d have to pore over the yellow pages, and you are also likely to end up with an unreliable service provider on your first try. Today, all you have to do is whip out your location-enabled smartphone and key in a few keywords. You can also look up reviews about the service provider to get a small degree of assurance that you will get quality for your money. Payment of purchases also meant sellers having to see cash registers and punch cards. Thanks to technological inventions and innovations, there are now devices and gadgets for these types of transactions. As the local commerce scene is becoming increasingly mobile, convenience is becoming the name of the game. Just by tapping on your mobile phone, you can browse shops, place orders and make payments for your purchases. Again, all without having to step inside the store. Go online and you will find many consumers sharing their experience as they avail of products of services in the local marketplace. Exactly how powerful is this “sharable experience” approach? It is so powerful that a single negative review can lose a restaurant a day’s worth of customers. One disgruntled customer can cause a store to lose thousands of dollars in its merchandise. One of the features that many buyers appreciate about local commerce is “same-day delivery”. Even “next day delivery” is already a good thing, compared to past experience of having to wait for days and even weeks for the items ordered to arrive at their doorstep. This makes even food delivery feasible online. Online shopping has succeeded in making the buying experience seamless and making it more personalized. For the part of the seller, they will also be able to track business statistics better, since the use of technology makes information gathering easier and faster. And there is the matter of transactions being settled without using cash outright. Right now, it is probably quite difficult to imagine a completely zero-cash society. However, let us not rule that out completely. If the leaps and bounds being taken by local commerce are any indication, that scenario might not be too far off in the future. In an attempt to adapt to changes brought on by local commerce innovations, retailers will have to be more flexible. They would have to be more receptive to partnering with other retailers and service providers in order to fulfill or meet orders. The most common example of a collaborative relationship is the one that retailers have with delivery companies. Stores will also find themselves having to work together and forging connections that will spell new and better shopping experiences for both buyers and sellers alike. Retailers will be more open to taking on more roles than originally intended. For example, it is possible for retailers to become supply sources. This is possible when they are the ones that reroute the order to the area where the customer is located and, from there, a local business will deliver the product to the buyer. Brick-and-mortar stores will now be transformed into showrooms, where consumers will be able to browse and scan items that will be ordered via online or mobile, and will be delivered to them the next day. Businesses will now make use of location-based and deals-on-demand visions in their operations. This is most commonly seen in couponing or direct marketing platforms. For example, by being part of Groupon Now, a local pizza place can now promote its pizza in its location, and it will also be able to offer a 50% discount on any pizza still available after 4 in the afternoon to walk-in customers. It is time to take a look at a couple of actual local commerce businesses that have gained success. For many, Uber is already a household name, founded in 1999 as a transportation network company. Through their Uber app, consumers can use their smartphones to submit a trip request. This request will be routed to Uber drivers who, using their own cars, will arrive at the location of the customer, to fulfill the details of the trip request. So how successful is Uber, you ask? Currently, Uber is operating in 58 countries and more than 300 cities all over the world. As of June 2015, it is estimated to have a net worth of $50 billion. With this mobile dispatch service, it takes only one tap to get a ride within minutes. Upon placing a request, an estimated pick up time will be provided, as well as the details of the Uber driver assigned to pick you up. Pricing is clearly indicated, and payment is done through your smartphone. This cashless element to this service further adds to the convenience. Much of the success of Uber is credited to the wide range of choices of rides that are available to customers. From an uberX vehicle to a taxi to the more high-end luxury cars, customers can take their pick. Uber also manages to address the very issues that the riding public always encounters. In short, it acts as a decisive and quick problem solver for riders and commuters. Healthcare providers have also gone the local commerce way, and a good example is Zeel, which provides “same-day, in-home massages with the best licensed therapists”. Users can now have Zeel Massage On Demand delivered to their doorstep. Zeel’s services are available in the New York City Metropolitan area, and parts of Florida and California. So how does Zeel work? Customers will have to book directly on Zeel’s website, or through their smartphone. Once the booking has been made and the details ironed out, a Zeel Massage Therapist (ZMT) will arrive at the home of the customer, or any location such as office or hotel, in as little as an hour. Zeel’s service has cut the need of people wanting to have a massage to take some time off their work, book a session in a spa or massage clinic, and drive all the way across the city to have the session. Zeel will get the booking request and the location of the customer, and have one of their Zeel Massage Therapists in the customer area come to the exact location. Another reason for the success of Zeel is how they uphold the quality of their service by maintaining a pool of handpicked ZMTs who are fully licensed, background-checked and experienced in massage therapy.